How did you come up with the title of this book? Did you have any other titles picked out? I wanted a one- or two-word title, something simple but strong. I considered two other titles: The Project, and Arcadia Lane. Neither seemed strong enough, though, or to convey what the book was about. 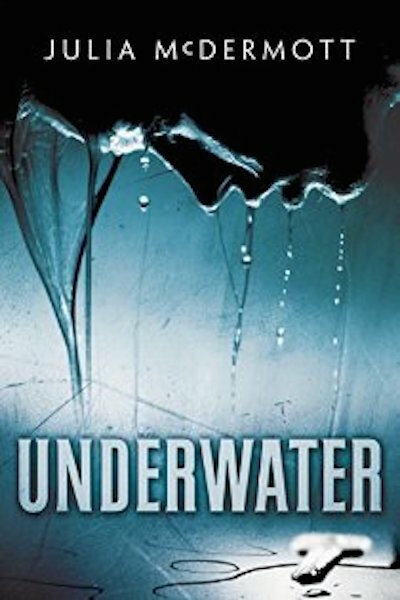 I chose Underwater because it has more than one meaning – and so do many of the chapter titles. How about the preface? Where did that come from? That was based on my own memory. My mother was a diving coach when I was little, and one day she took me with her to an indoor pool where she was working. She put me in the pool and gave me a kickboard, and I remember her standing on the side and telling me to kick and keep going across the pool. It was the first time I remember being in a pool, and I learned to swim that day. Have you ever done a home renovation, and have you ever been “underwater”? My husband and I have done two renovations on the home we own, and we have been underwater on previous homes. Our first house in Texas was underwater in the late 80s when we had a young family and had to move across the country for a job. Years later, we built a new home in the midwest, but that house was underwater when we moved to Atlanta for another new job. How did you handle it? Did you have to downsize? The first time, we had to seriously downsize. We cut anything unnecessary from our budget. We decided on an amount to spend on food every week, took a calculator with us to the grocery store and paid in cash. I remember putting items back on the shelf that we couldn’t afford. We also kept track of our money on paper, down to the penny. After that experience, we rented for a while and built up our savings. When we found ourselves having to sell our house in a troubled market again in the late 90s, we were able to write a check for the loss. When we decided to renovate our current home, we waited until we had the money to do it, and knew we weren’t going to move. How did you come up with the characters – and with their demons? The characters came from my imagination, and in many ways, I related to some of their demons – I won’t say which ones. I enjoyed writing from their different points of view and letting the reader get inside their heads. How about names of places? Are they fictitious? Yes. Other than Peachtree Street and a few well-known Atlanta neighborhoods, they are…except for Chateau Eza in Eze, France, a lovely spot I visited with my husband. Why do Candace and Rob like France, why is David’s assistant French, and why are there other French references in the novel? Quite simply, because I love France! Why is Candace so particular about the new swimsuit line, and the merchandising of it? Candace is particular about everything, and she has been planning the line for a number of years. She wants it merchandised a certain way because, if I were Candace, that’s how I would do it. How did the new updated cover come about? For the first edition, published in August 2013, I wanted something simple. I chose an image of a water line with a smudge of blood below. For the new edition, released in November 2014, cover artist Scott Barrie of Thomas & Mercer worked on several new ideas, and the result is the cover image you see above. It’s a bit more descriptive, more menacing and more powerful. I love it!